FORT CAMPBELL, Kentucky (CNN) -- The 101st Airborne's senior commander in effect ordered his soldiers Wednesday not to commit suicide, a plea that came after 11 suicides since January 1, two of them in the past week. 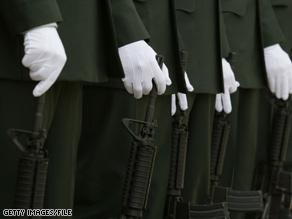 An Army honor guard stands ready to fire a salute at Fort Campbell. Fort Campbell's suicide rate, the highest in the Army, "is not a good statistic," he said in remarks to one of four divisions he addressed during the day. After nearly one soldier per week committed suicide at the post between January and mid-March, the Army instituted a suicide prevention program that "seemed to be having good effects" until last week, when two more suicides occurred, he said. "Suicide is a permanent solution to what is only a temporary problem," Townsend said. "Screaming Eagles don't quit. No matter how bad your problem seems today, trust me, it's not the end of the world. It will be better tomorrow. Don't take away your tomorrow." He urged anyone feeling hopeless or suicidal to "tell somebody." "You wouldn't hesitate to seek medical attention for a physical injury or wound; don't hesitate to seek medical attention for a psychological injury." Townsend exhorted any soldier who suspects that a fellow soldier may be feeling suicidal to act -- first by asking how the soldier feels, then by escorting him or her to help. "Do not wait," he said. Soldiers can turn to their leaders, chaplains, medics, social workers, teammates, family and friends, he said. The military culture attaches a stigma to mental illness that needs to be reduced, he said. Soldiers who acknowledge they are considering suicide can suffer severe repercussions, such as losing opportunities for promotion and access to firearms, he said. If the Army is serious about addressing the problem, it needs to address the stressors common to soldiers, including financial problems, marital problems, frequency of deployments, length of deployments, deployments to hostile environments, exposure to extreme stress and service-related injuries, he said. The role of alcohol too must be addressed if the rate of suicide is to be lowered, he said. "More often than not, these are individuals who'll get liquored up, so to speak, and have access to a gun and die from a self-inflicted gunshot wound," Kaplan said. Bill Lichtenstein, who serves on the board of the Rosalynn Carter Fellowships for Mental Health Journalism, the advisory council of the Center for the Advancement of Children's Mental Health at Columbia University, and on the advisory board of Families for Depression Awareness, was equally unimpressed with Townsend's tack. "It's the equivalent of 'Just Say No' to prevent drug abuse,' " he told CNN in a telephone interview. Screening techniques that involve a series of questions are available to identify people at risk for suicide, he said. "Prominent among them, if not the most important question is: Have you made a plan for suicide? Using a simple battery of questions, you can suss out people who might be at risk, which is far more important than telling somebody, 'Don't take your life,' " Lichtenstein said. The problem is not limited to Fort Campbell. The Army has reported 64 potential active-duty suicides this year; 35 have been confirmed as suicides, and 29 are pending determination of manner of death.